and it takes a completion closure which itself takes a bool & error and returns void. else log that the bmiSample was saved successfully. and it takes a completion closure which itself takes an HKSample & error and returns void. else get that mostRecentWeight as self.weight, format it and set it as the label’s text. otherwise set the completion closure with the results and no error. You made it to the end! Ok, so we are basically going to be adding another store to our app and reading and writing data to THAT store as well. 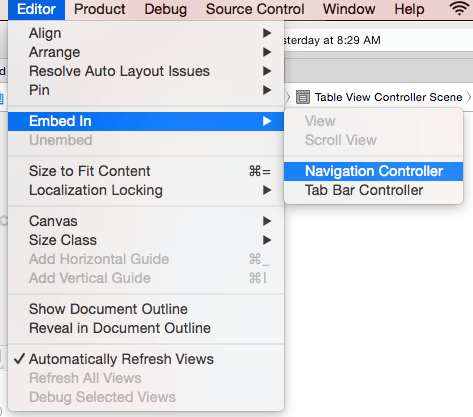 First let’s add a new tab and make it a UITableViewController as well. It will have dynamically populated cells. Now since this is not a CoreData tutorial, I will not go into the details, but every CoreData project needs a MOM, MOC and PSC. That is what we initialize here. We are creating a CoreDataStack instance and we are creating a mutable array. 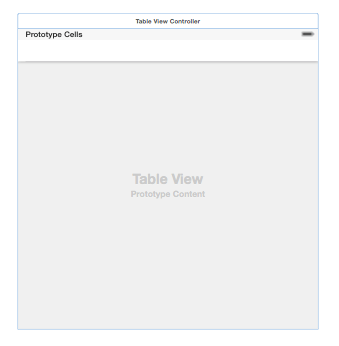 let JournalViewControllerTableViewCellReuseIdentifier: NSString = "Cell"
as a property at the top of the class. Basically you need to ensure that you append your project name to the Class name field. Now run your app and go over to the Workouts tab and see your hardcoded workout in the tableview. cell.detailTextLabel!.text = myWorkout.totalTime.stringValue + " mins"
There, now the user has a little mode detailed info of the data displayed. We could go on and modify the cell to hold more data or even be selectable such that it would segue into a detail view controller to display all the info. //E - Perhaps just store laps and meters per lap = total metes in some extra field within the SwimFit app to display it. This will save that other data, which is not HealthKit or health store data, into CoreData for later use. Now let’s just go modify our SwimmingData view controller to make it fetch. 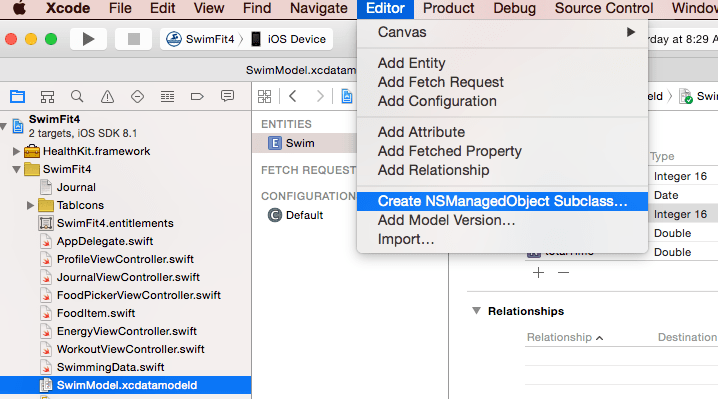 let results = coreDataStack.context.executeFetchRequest(fetchRequest, error: &error) as [Swim]? And now call this method from viewDidLoad. 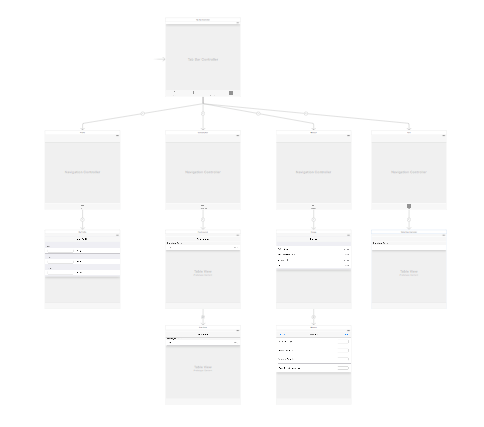 This will load your fetched data from CoreData into your tableview. This will fetch the items in the order they were inserted, but you can also add a sort descriptor. cell.detailLabel.text = mySwim.totalTime.stringValue + " mins"
where date would be the formatted value of course. Well it has been a long journey. 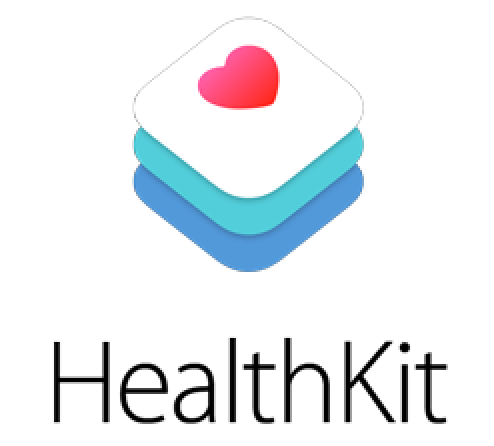 I hope you learned enough about Healthkit to feel comfortable enough to start working on your own app.